Making money from your WordPress blog is real - I make over $100 per day! I make $112 per day, on Google AdSense. Not to brag, but this is a very nice passive income, considering that last time I updated my websites about 6 months ago (sometime in March or April 2017). In this post I will quickly lay out how that happens. Now I don’t make $112 every day – that is an average of all my AdSense income so far this year ($32,334.99) divided by 289 days (today is Oct 16, 2017). In screenshot I selected all AdSense for content earnings from Jan. 1, 2017 to Oct. 16 2017. Keep in mind it about 5pm, so there will me more earnings today. While the graph shows a steep growth curve from January to June, and then slight decline, the revenue for last 3 months averaged about $3500/mo, which is more that $112/day. So my projections are that income will continue to be over $100/day through the end of 2017, and I will earn about $40K for the whole year, just with AdSense. As mentioned, i barely do any work with my sites, after initial acquisition and optimization. I sometimes have 1-5 new articles created, just to freshen up the content and then go on HARO to score some quality mentions, to keep up the rankings. Then I get too busy with other projects, and just don’t have any time to update my sites. I typically spend no more than 40 hours of total work on my investment sites. I also don’t build sites (anymore) because it’s very time consuming for my to create content and get sites to rank. I prefer to invest, and recoup my initial investment in 12-18 months. Some projects take longer, while others pay for themselves in less than one year, and start making NET income! I haven’t had time to publish later months reports, but things are going pretty well! For example, in Dec 2016 I made $2,994.08 from ALL my sites and all sources of income. 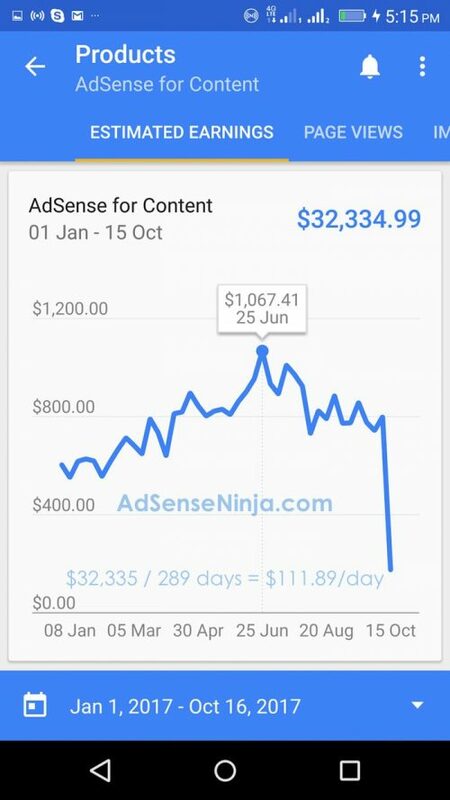 In Sep 2017 I made $3,418.79 just from AdSense. , and this number does not include the sites that are in my wife’s name. 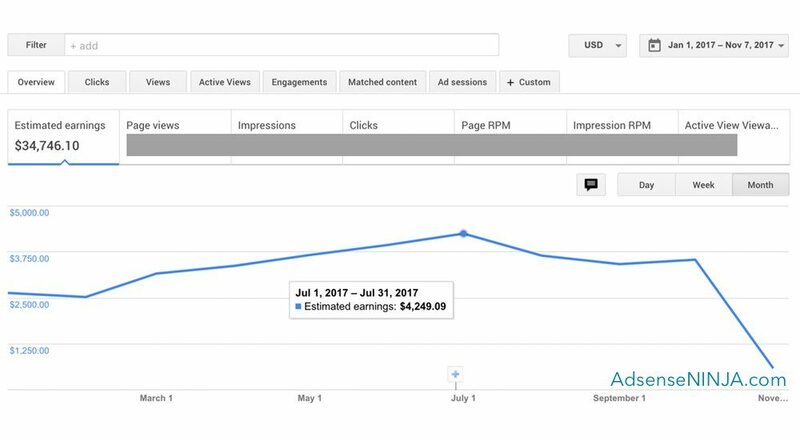 Update: In October 2017 my full month AdSense income was $3,539.67. Not everyone can buy and monetize investment sites. But most people can run a pretty successful blog. Most tools that you need are either FREE or very inexpensive. WordPress is free, and has thousands of great and free themes and plugins. So basically all you have to do is create great content for your readers and do some social marketing and SEO. But monetizing WordPress blogs is a different story. Most bloggers are not good at optimizing AdSense, let alone placing it in the right places across their blog. There are a million of plugins that do it, but none of them do it well. Problem is – these plugins were created by programmers – not Adsense publishers. I was one of those bloggers struggling to find optimum way to display ads on my blogs/websites. Since I could not find a good solution, I first resorted to modifying Themes/templates to automate ad placement. I even had to learn PHP and CSS (took a web programming course in a community college). While this worked great in terms of income, it was very time consuming, and couple of times I crashed my blog (by messing up PHP code) and even got my website hacked! So i decided to make the ultimate AdSense Plugin for myself. I included ALL the important features in it, and none of the BS / useless stuff that you can find in every free plugin. 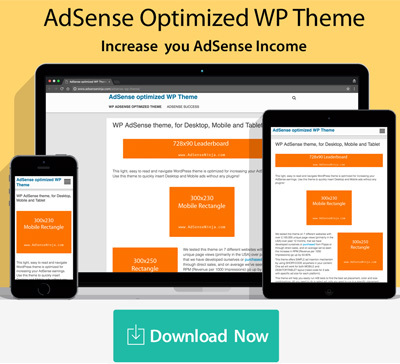 My plugin has everything I need to quickly display ads across any WP blog, and do so in a way to maximize income! Now you can use my methods for free (only you will have to tinker with your Theme PHP code) or use my plugin. This is exactly what I’ve been doing for last 3-4 years to put Adsense on all my WordPress sites. It is a cumbersome and time consuming way to do things, but it REALLY, REALLY works way better than using free and even paid Adsense plugins! I’m talking about increasing blog revenue by 30%, 50, even 90% in some cases. Trust me – spending 2-4 hours once, is well worth making extra $300-1000 every month! – Displaying mobile and desktop ads in WordPress. – AB testing – limited to templates, since you cannot put PHP code directly in WP post / pages. CAUTION: The free methods can and often will break your website during testing! It will require modifying functions.php file and Theme template files ( header.php, footer.php, single.php, index.php, page.php, etc) and pasting some PHP code. If you make mistake, your website and even WP Admin will not work. You will also have to create some new files inside your theme. FTP or cPanel access to your blog. Backup of ALL files that you will be modifying. 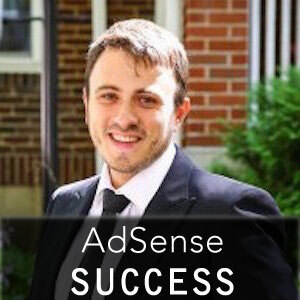 AdSense Investment Site – $2579 Net Profit in 12 Months!